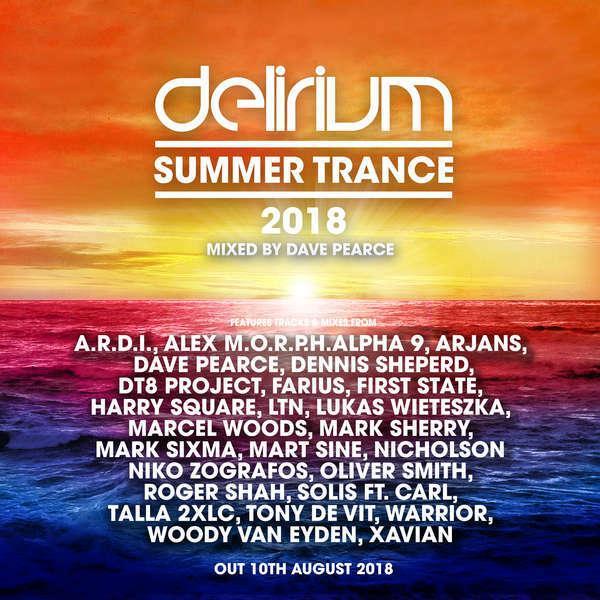 Dave Pearce is back for the second year with Delirium Summer Trance 2018 a new album presenting a collection of some of the biggest progressive and trance tracks of the year so far. Opening on a progressive tip the album kicks of tunes including the sublime Above & Beyond favourite Oliver Smith, Lovingly ft Amy J Price which is included alongside music from Farius, Spencer Brown, DT8 Project, LTN and Enzo. Some of the most popular tracks from Dave's weekly Delirium trance podcast and radio show are featured including the massive Coldharbour Recordings, Dennis Sheperd and DIM3NSION - Amigos, Mark Sherry's tech-trance fused collaboration with Alex M.O.R.PH Magnetar, Craig Connelly and Roxanne Emery's - This Life and the amazing vocals of Cristina Novelli with Mart Sine on Carry You. As well producing a plethora of hot new productions 2018 has certainly been the year of some great remixes too that have been rocking summer festivals like Tomorrowland - the album features Mark Sixma and Emma Hewitt's rework of Everything But The Girl - Missing, Mark Sherry’s rework of Warrior - Warrior and to mark the 20th anniversary of the passing of Tony De Vit the album features the Nicholson remix of his legendary track The Dawn. About Dave Pearce Dave Pearce launched Kiss 100, the UK’s first legal dance radio in 1990 before taking his record box to the BBC in 1995 and creating the iconic Radio 1’s Dance Anthems show. Today he continues to DJ and produce and while also running his Delirium Record label and radio show. 20 Roger Shah & JES - Star-crossed (Extended Uplifting Mix) 7.28?